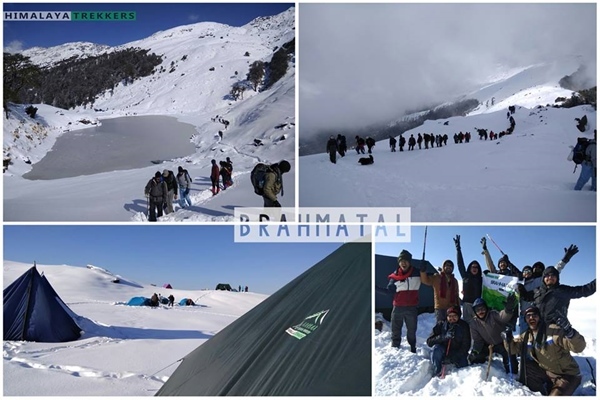 Upcoming Brahmatal treks on 24th & 31st March 2019 (Departing in the morning from Kathgodam, returning to Rishikesh/Haridwar evening, 6D/5N). More groups to follow in April. As we update this on 5th March 2019 Lohajung has leftover snow here and there, specially under shades. 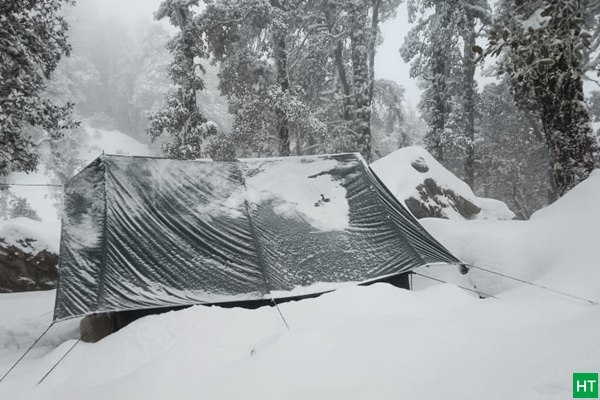 The trek base Lohajung received at least 3 major snowfall of 1 foot or more deposition in three occasions, first one during 22nd Jan, then one followed in mid February and last one in the end of Feb, 26th & 27th Feb.
Usual winter season started by mid of Dec 2018, with little snow, as expected. Groups received patches of snow towards top. Around mid January weather was conducive for heavy snowfall. 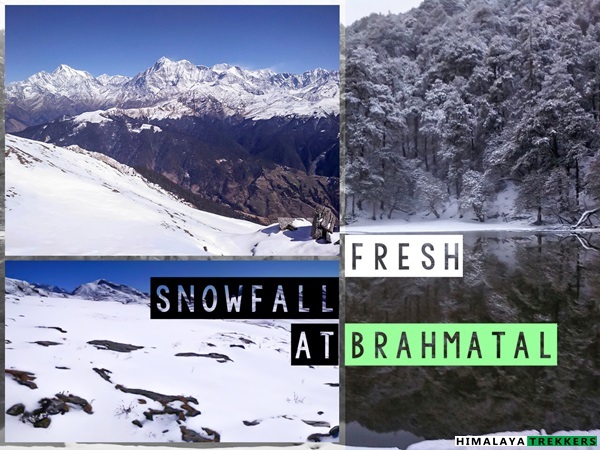 3 major snowstorms hit the area, one is Jan and two in Feb. Intermittently it snowed frequently throughout February ranging from 2/3 inches to 5/6 inches, depending on altitude covered during Brahma Tal trek. 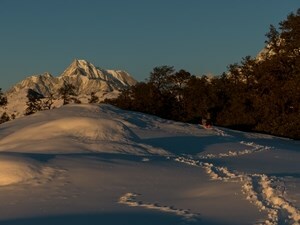 The following picture is just to assure you all that Brahma Tal trail will remain snow covered till end of March for sure. 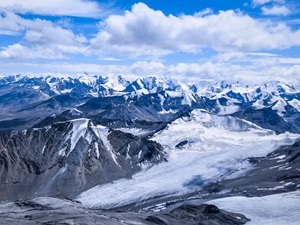 Also it is not uncommon to snow around 3000 m/10000 ft, even in March, which possibly will remain as late as mid of April 2019. 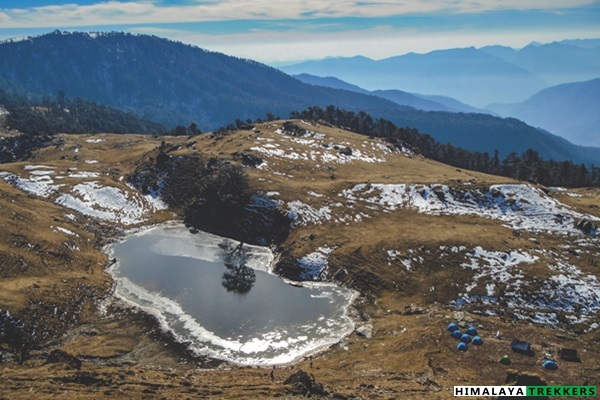 There are indeed similar routes like Brahma Tal trek (also spelled “Brahmatal trek“) in the Himalayas when comparing beauty but definitely found at much higher altitude. 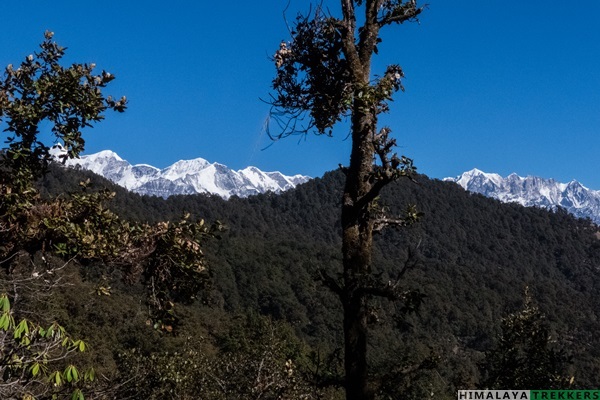 Brahma Tal trek is an easy to go winter trek offering almost all you can think of a winter trek destination and gaining popularity rapid in last couple of years. 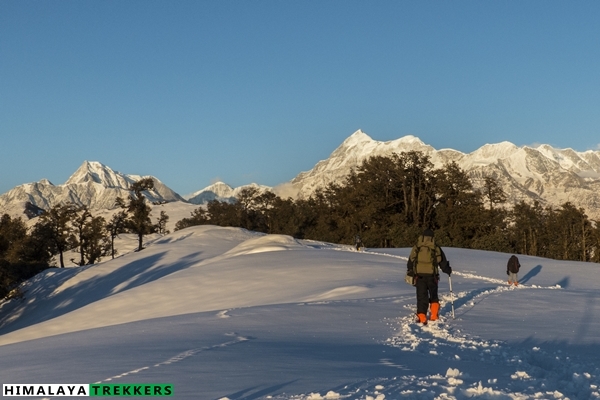 Never ending ridge lines, sprawling Bugyal, High altitude lakes, majestic peak views and fresh snow on the trail are compelling proposition for the Brahma Tal winter trek. 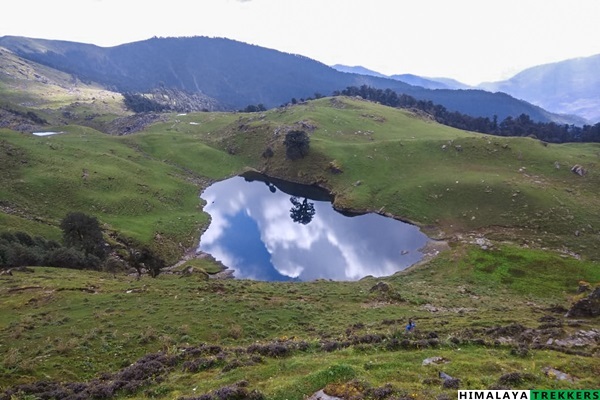 The lake is a hidden (Brahma Tal Geo coordinates: 30.176878°E, 79.589449°N) and secluded one amidst the ridge, where as per legend, Lord Brahma meditated. 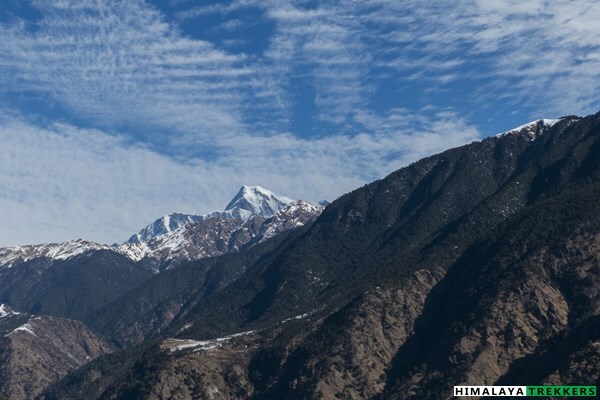 The peak view from the route is captivating, from east to west you can see the High Himalayan ranges. 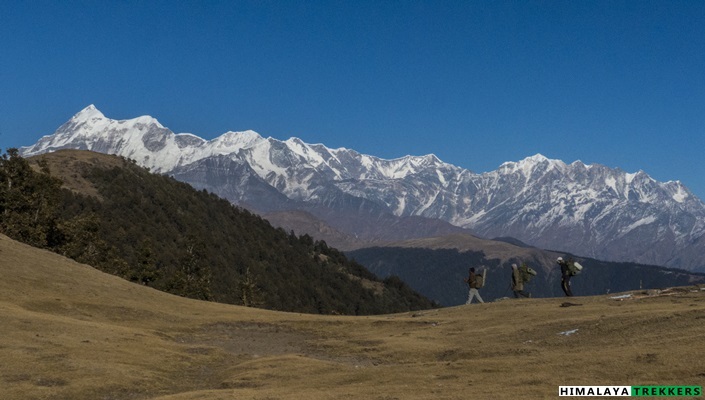 On the right eastward direction we can see Mrigthuni, Trishul, and straight north the Bethartoli Himal and Nandaghunti. 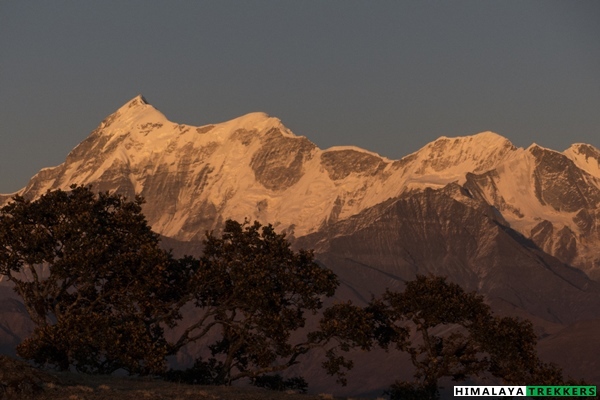 On the left westward side we can see the massive Chaukhamba, Neelkanth, Kamet, Hathi and Ghoda peaks. 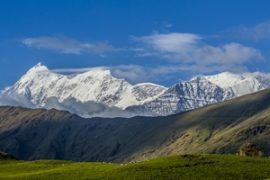 This is just the opposite ridge of the famous Roopkund trek and offers a Birds-eye view of the route including Ali Bugyal, Bedni Bugyal, Roopkund and Junargali including far poised the famous Ronty saddle. 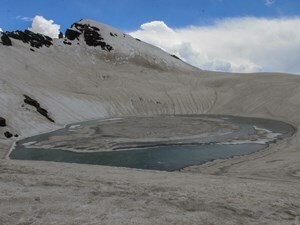 Two fairly large lakes, Brahma Tal and Bekhal Tal remains mostly frozen during winters. The best season to explore this trail is either winter or in the springs. During winter weather normally remains clear and panoramic beauty of the surrounding is unmatched. Adequate amount of snow is another reason that this is getting popular in recent years. In Spring the trail is bountiful with Rhododendron blossoms while the last patches of snow start melting. 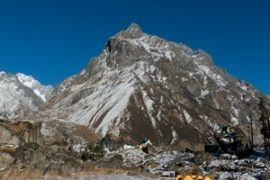 For you who want a longer duration camping trek may combine Ali Bugyal and Bedni Bugyal trek to complete a circuit around Lohajung. En route Brahma Tal, Nanda Ghunti (L) and Trishul are just two! 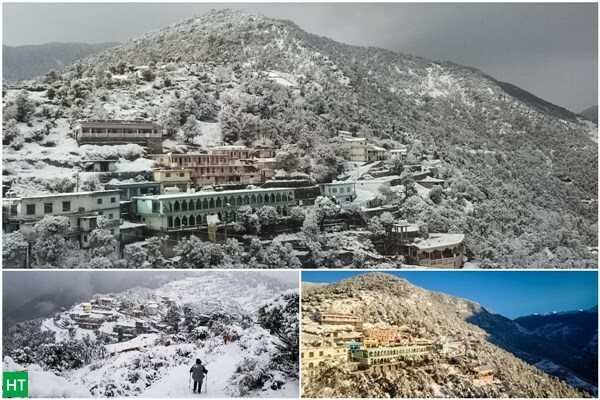 This winter, snowfall deposition was pretty low in Uttarakhand and Himachal stretching a large region as late as mid of January. Brahma Tal trail suffered this as late as January third week. with just one initial winter snowfall in first half of December. 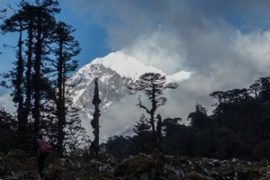 On 23rd January we had two groups (10 person’s in each) camping at Brahma Tal – one after the summit to Khamila top and another coming up from Bekhal Tal to Brahma Tal. Around 6 p.m it started to snow and in four hours it snowed around one and half feet. 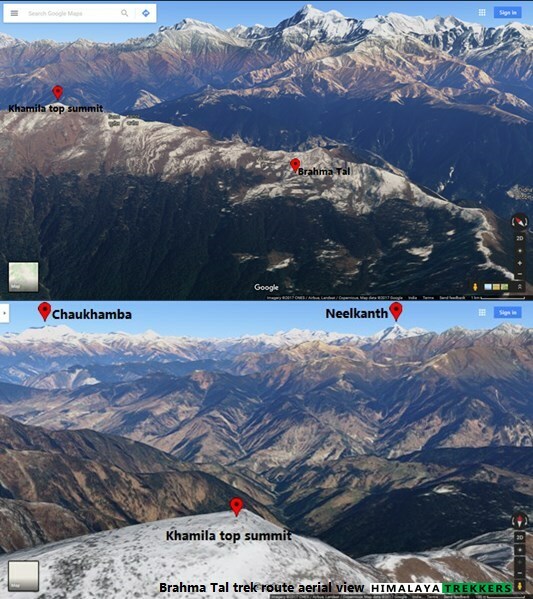 Below collage is taken by our staff while coming down from Brahma Tal on 24th Jan. This should remain around 15 days and another snowfall may occur in February. On 12th February it snowed again on the trail for around 6 inch and now again it covered with snow. As this year’s snowfall is rather late, we expect another one probably in February or beginning of March. Winter: From December to February during winter the daytime temp remains cool and nights are cold. Late night/early morning temperatures at Lohajung, Bekhal Tal and Brahma Tal can be around 0° to 2°C, 0°C to -2°C and -5°C to -10° C. Though inside tent the temperature will be 10°C warmer but still can be freezing. We will arrange a pickup from Kathgodam railway station to Lohajung and drop from Lohajung to Haridwar. This will be shared by the team members on actual basis and paid directly to the driver. his will be shared equally by the team members on actual basis. You pay directly to the driver/transporter. The fare is Rs 5500 for a Tata Sumo/Mahindra Maxx one way. This can accommodate 6 to 8 people. A Tempo Traveller charges Rs 9000 (12-14 seat) one way. While returning the charges are RS 6000 and Rs 10000 respectively for a Tata Sumo and Temp Traveller from Lohajung to Haridwar. Similarly it is RS 5500 and Rs 9000 from Lohajung to Rishikesh. This is NOT included in TREK FEE. 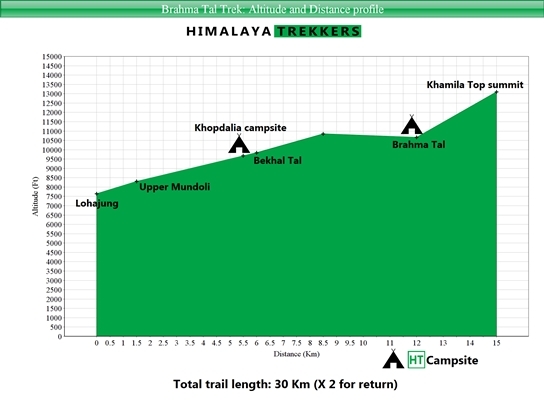 To reach the trek base Lohajung independently/public transportation check the details in GETTING THERE TAB. Duration: 4 days of trek; Kathgodam to Haridwar in 6 days. 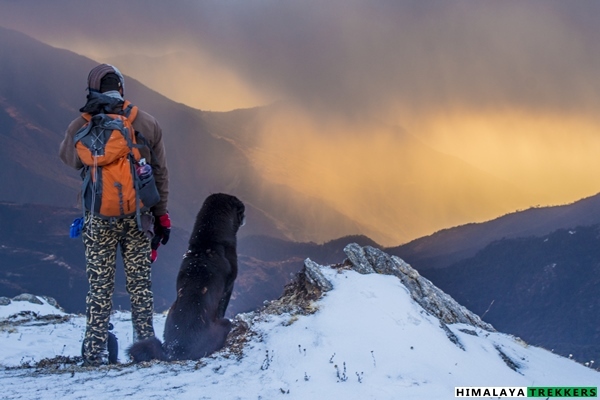 Prerequisite: Ideal for beginners/first Himalayan trek. 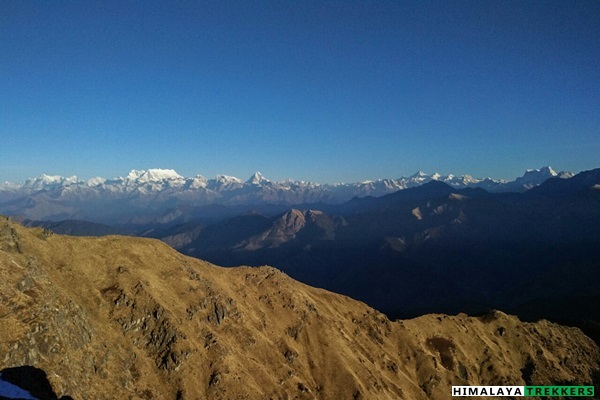 Highest Point: Khamila Top ~ 4000 m/13120 ft.
Access: Trek starting point (trek base) is Lohajung, 220 Km from Kathgodam. 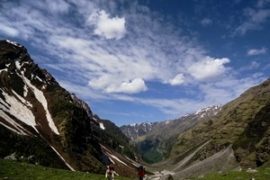 Trekkers need to reach Kathgodam on Day 1 morning (latest by 7 am). Return to Haridwar on Day 6 late evening (8-9 pm). Arrange your tickets for inward journey and return accordingly. We will arrange a pick up and drop from Kathgodam to Lohajung and back. This will be shared equally by the team members on actual basis. You pay directly to the driver/transporter. The fare is Rs 5500 for a Tata Sumo/Mahindra Maxx one way. These can accommodate 6 to 8 people. Similarly a Tempo Traveller charges Rs 9000 which can accommodate 12 people. This is NOT included in the TREK FEE and to be payable directly to the driver/owner. From Kathgodam there is no direct bus or shared car service to Lohajung. Reach latest by 6 am to Haldwani (The city, 4 Km before Kathgodam) and take a shared Jeep service to Deval. This is is 25 Km before Lohajung. From Deval you may get another shared service to Lohajung or you may have to hire one. 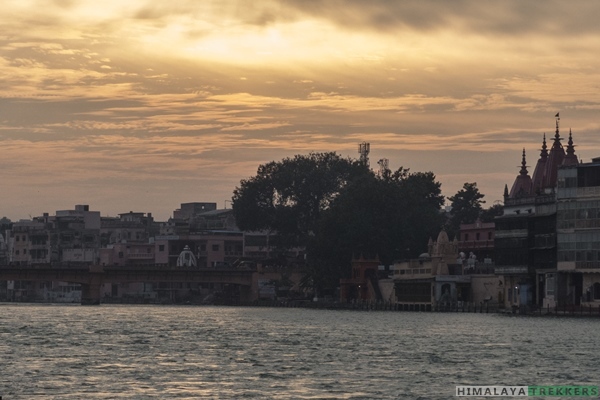 If you travel from Haridwar side, then reach Rishikesh on the previous night (Day 0, 25 Km from Haridwar) and board the bus for Mandoli/Lohajung at 5 am next morning. This private bus takes 12 to 14 hours to reach Lohajung. As this is a privately operated bus so may not operate during the high demand of Chardham yatra season. The route is via Devprayag, Rudraprayag, Karanprayag, Tharali and Deval. 260 Km. From Lohajung the bus to Rishikesh starts early in the morning by 6 am and reach by 6 pm . For the treks in Kumaon or in the bordering area of Garhwal, one has to reach Kathgodam/Haldwani normally. Lal Kuan is just 20 Km and Haldwani is 5 Km before Kathgodam. Bus, shared taxi and private cars are available. You can fly or by train reach New Delhi as per your convenience from any part within India. Reach Delhi accordingly that you have enough time for transit withing Delhi. You can reach KATHGODAM/HALDWANI EASILY FROM NEW DELHI BY TRAIN OR BUS (~ 6/8 HOURS) AND IS AROUND 270 KM. Following trains are good to reach Kathgodam and run daily. Haldwani buses are more frequent than that of Kathgodam. Its easy to reach Kathgodam from Haldwani which is only 5 Km away. From Delhi Airport or Station you can reach ISBT Anand Vihar via Delhi Metro service (http://www.delhimetrorail.com/metro-fares.aspx). Trekkers reaching on the previous day before the journey to the actual trek base need to stay the night in Kathgodam. There are few options in Kathgodam for spending a night while staying in Standard accommodation. There are privately run hotels/lodges near Kathgodam railway station & Haldwani Bus terminus. Normally you reach from trek base to Kathgodam by 5/6 pm in the evening. You can take any train after 7 pm or regular bus service as mentioned above to reach Delhi or directly to your homeward journey. Pickup from Kathgodam in the morning and reach Lohajung (~ 2320 m/7600 ft) which is 220 Km away. The journey may take around 10 hours with a break or two. 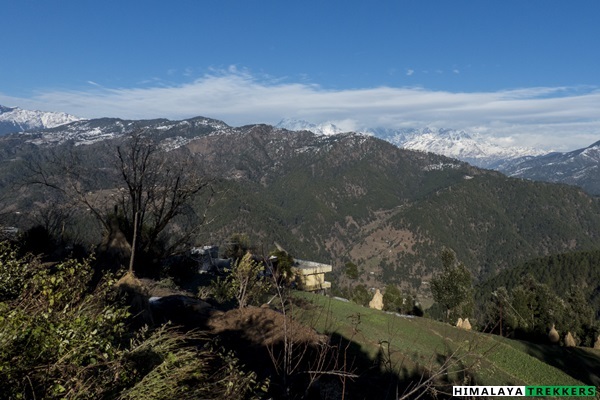 The road is through the Kumaon region and mostly goes along wide spread valleys of Shivalik Himalaya. We cross Almora and Kausani on our way. 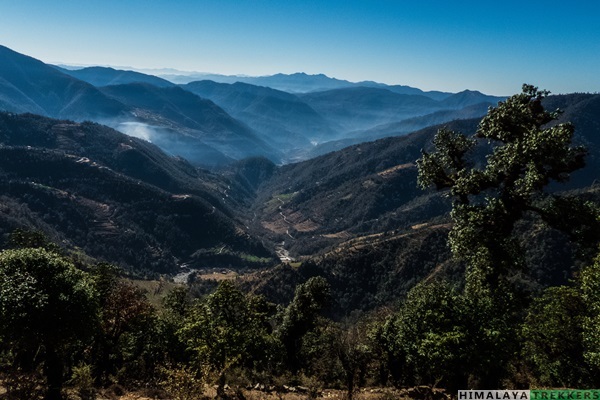 From Gwaldam onward the road enters in the Garhwal administrative region and the road is gradually winding and goes through the conifer forest. The last stretch of the journey from Deval to Lohajung has considerable height gain. Lohajung has one GMVN tourist lodge, one Tourist Rest House and few private hotels. All the major mobile networks have connectivity here. The sunset from Lohajung needs a special mention indeed. Warm colours on Nandaghunti massif is bound to make you speechless. The night accommodation in Tourist Rest House/Lodge. Our trek starts today. 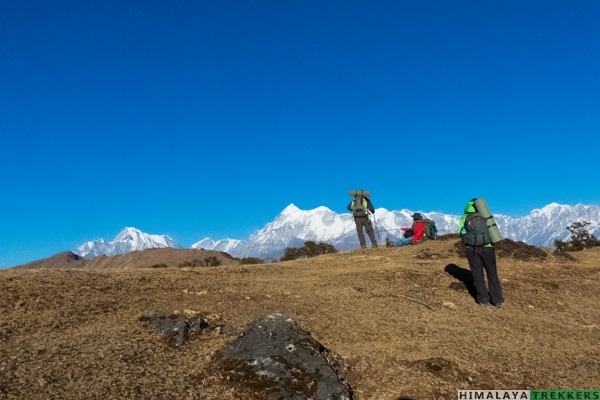 We walk gradually up on the ridge starting just beside Lohajung and walk on a gentle gradient up encircling the mountain. On the route we see magnificent view of Didna village and Nandaghunti mountain while pausing and looking back. In contrast fascinating ridge lines forms and Mandoli village in front captivates our view. The walk is mostly inside the jungle of conifer, Cedar, Oak and Fir. We gradually climb the ridge and for an hour or so. From here we walk along a ravine which is canopied by dense vegetation. 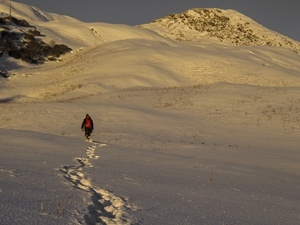 Sunlight hardly enters here and probably you will get deposited snow here, if not already 🙂 After a while we take a left and reach an opening suitable for camping. 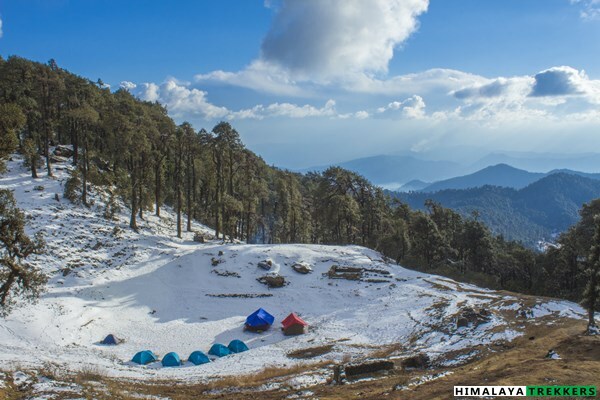 This lovely camping ground is called Khopdalia (~ 2950 m/9670 ft). Total distance is 6 Km and can take 4/5 hours. We camp for the night. Bekhal tal is only 10 minutes from here. You may visit in the afternoon with your guide. Today morning after breakfast we take the main trail from campsite and get inside the canopy of forest, once more. The forest is a mix of Rhododendrons and Conifers. In spring the forest blooms in pink and red. In next 10 minutes we reach Bekhal Tal (~3000 m/9840 ft). This medium size rectangular lake has a small temple at one of the edge of the it. Normally it starts freezing in December and remains frozen till March. From here we have to climb the ridge which is a sustained moderate climb for one and half hours. We continue our hike inside the forest with occasional breaks. After completing this climb we reach the edge of the “Bugyal”, the high altitude meadow of the Himalayas. 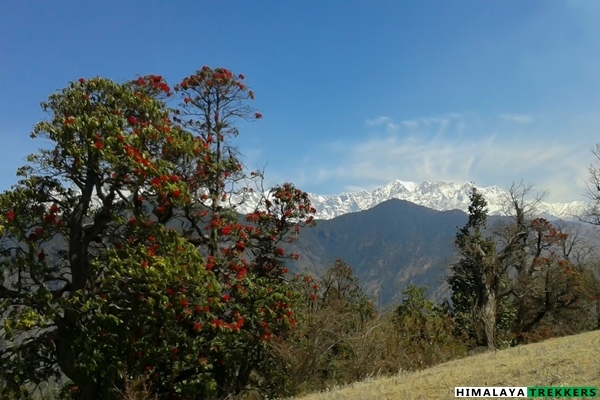 This fringe of the forest is residing place for Himalayan Monal during winter. From here onward the view on our right, i,e, the north-east side unfolds with extended panorama. 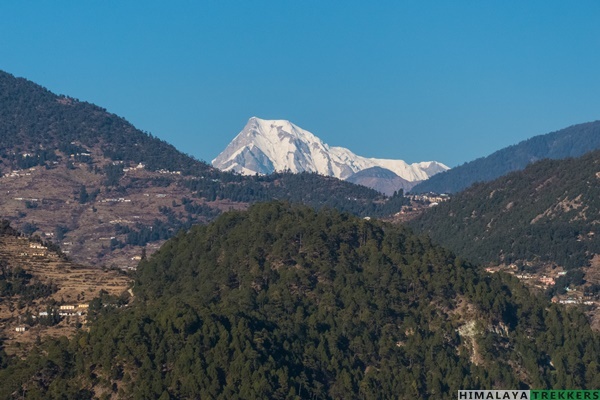 Peaks of Kumaon like Maiktoli, Devtoli to Mrigthuni, Trishul and Nanda Ghunti, one by one. 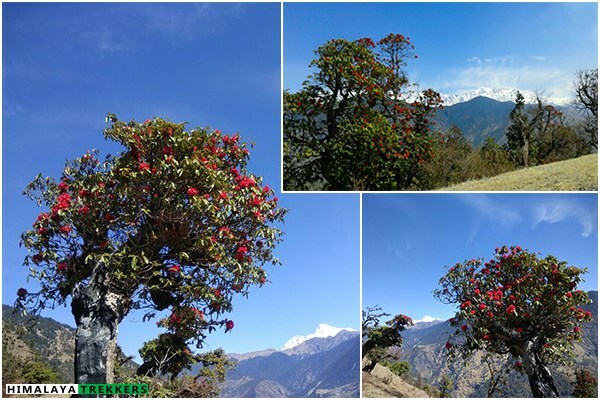 We walk along the ridge and witness one of the most enticing panorama of Garhwal. After about an hours of fascinating walk we leave the ridge and descent on the left slope to reach the lake Brahma Tal (~3250 m/10660 ft) surrounded by the slopes of mountain. 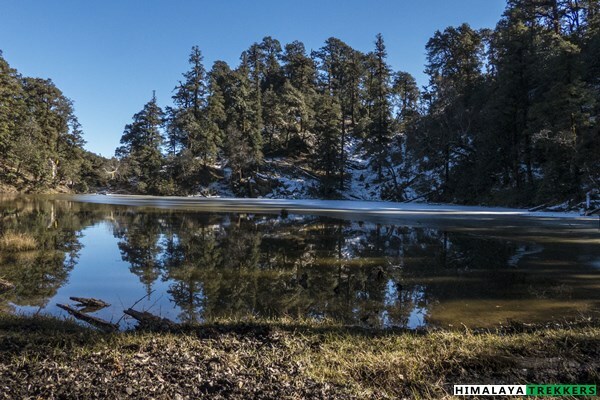 This is a medium sized longitudinal lake , with few last remaining trees on this altitude. The lake is hard to locate from far but one needs to be close enough to get the glimpse of the dark turquoise water. We set up our tent on a suitable ground around Brahma Tal. Distance is 6 Km and may take around 4/5 hours.We camp for the night. 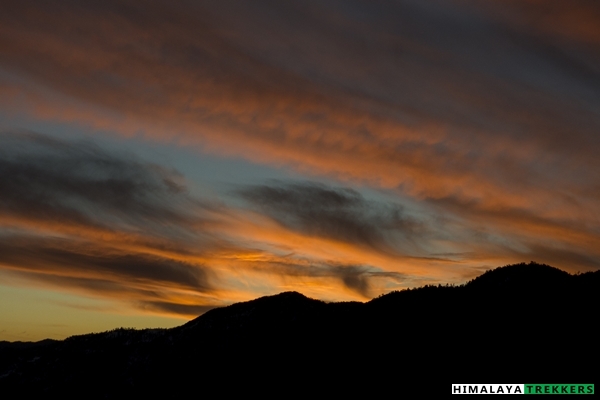 Optional: In the afternoon climb up the ridge to witness magnificent sunset. 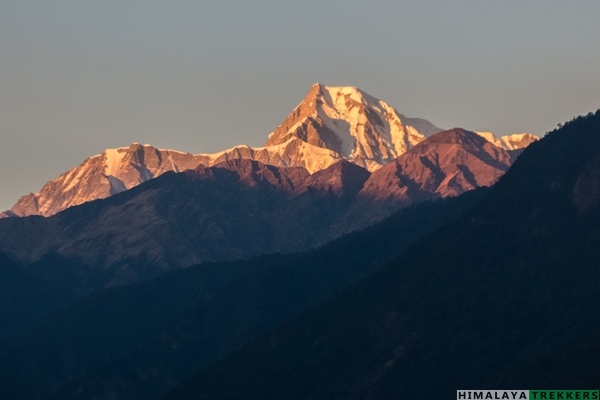 Changing hue on Trishul, Nandaghunti and Mrigthuni will surely spellbound you. A round trip should take 2 hours from camp site. Today we will attempt the summit of the top which we see to our north west. This is actually the crest of the ridge which we followed yesterday before descending to the camping ground around Brahma Tal. Its a moderate climb to the top of the ridge for 3 to 4 hours. You need to start by 6/6:30 am in hthe morning to reach top by 10 am. Two peaks, higher being the west one (Khamila Top, also called Jatropani at 4000 m/13120 ft) and the east one a few hundred feet lower. Initially we cross the meadow and take the ridge towards the summit. The peaks westward to Nanda Ghunti uncovers from this trail as we go more towards the top. The last stretch to summit is boulder strewn. The view from top is truly a panorama of more than 180°. 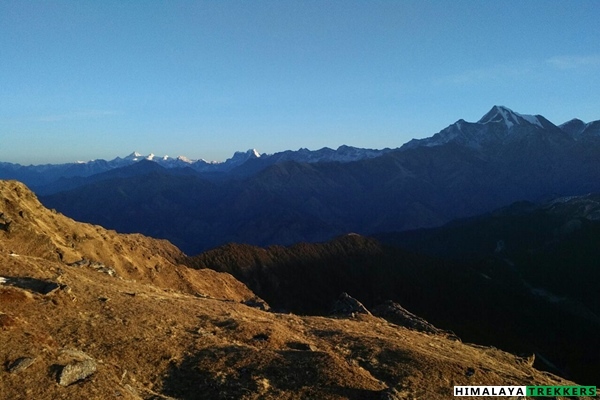 From here you can see peaks of Badrinath valley, from west Chaukhamba, Neelkanth to Hati Ghoda to our north east Nanda Ghunti, Bethartoli Himal, Ronty, Trishul, Mrigthuni to Maiktoli, Devtoli in east. After spending half an hour we start descending our camp at Brahma Tal. You will get a birds eye view of the camp site and the valley beneath. Total distance is 8 Km and may take up to 6/7 hours. Today we descend to Lohajung retracing back our route. Another chance to witness the panorama if you have missed while reaching. This should take 6/7 hours. In the evening if you have interest try to see the sunset on the valley side, i.e. towards Deval/Gwaldam. Walk 10 minutes from Lohajung bazaar down to any suitable bend. Surely you will be amazed by the colours of the sky. Accommodation in lodge. Today morning we start our return journey and this time to Haridwar. We follow the same route till Tharali and turn right towards Karnaprayag following the turquoise Pindar river. From Karnaprayag we follow Alaknanda river till Rudraprayag where another tributary Mandakini meets. Following the river valley at Devprayag, two main sources Alaknanda and Bhagirathi river form the holy river Ganga. Rishikesh is another two hours journey from here. Finally we reach Haridwar completing our journey. Trip ends here. Note that it is also possible to return to Kathgodam like you reached Lohajung. 2 night’s accommodation at Lohajung (Day 1 & Day 5) in lodge on sharing basis and dinner. Accidental Insurance Policy covering high altitude trekking tours (For Indian nationals it is included in the TREK FEE, up to 60 years of age). It covers your trek as well as your return journey to Haridwar/Kathgodam. Transportation from Kathgodam to Lohajung and back to Haridwar. ₹ 5500 for a Tata Sumo and ₹ 9000 for a Tempo Traveller, one way. You pay directly to the driver, sharing equally. 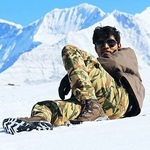 I am a beginner trekker and before this trek have done 3 treks, but this trek changed my perception towards trekking, earlier i used to believe that one has to leave all the comforts while in trek but entire staff of HT changed this thought. Food provided during trek was awesome and co-operation and service of entire staff was incredible. Mr. Dev Singh and Mr. Mahipat Singh Ji are best at their field and Aritro Da was cherry on the cake. All the other trek mates were way more enthusiastic than my expectation. I had an awesome time with best people. Thank you HT and all trek mates for wonderful experience and memories. 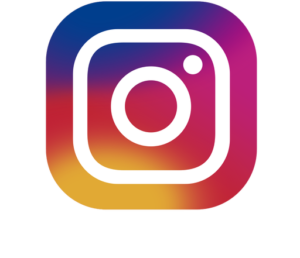 Plan zeroed in Jan 2017 with Himalaya Trekkers to Brahmatal. We, a group of 12 opted for a customized trek with HT. 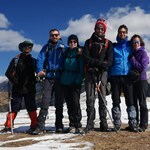 Being the first time trekkers in Himalayas, we were all excited and was looking forward for safe and fun filled trek. HT was patient enough to answer all our queries, though we raised the same queries over and over again. Recommendations and instructions flowed down to our team from HT to ensure that we were all geared up for the trek. The team accommodated all of our needs, and helped us throughout the trek. Team was very humble and co-operative. We lived like a family though it was just for a very short time. Team HT and all of us exchanged experiences and smiles. Looking forward for many more memorable journeys with HT. Thank you all for the great organisation, we all enjoyed our stay in India and especially the trek! Clear expectations by email before the trek, and good reactivity. Very Nice, Efficient, Staff during the trek.All in one, all good. We went to Brahmatal trek on new year. The trek was awesome, breathtaking. 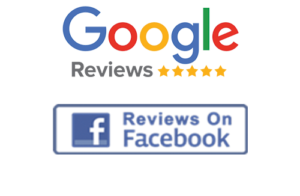 Very well organised and friendly staff. Had a lot of fun altogether. This trek has been an unforgettable experience in my life !!!! 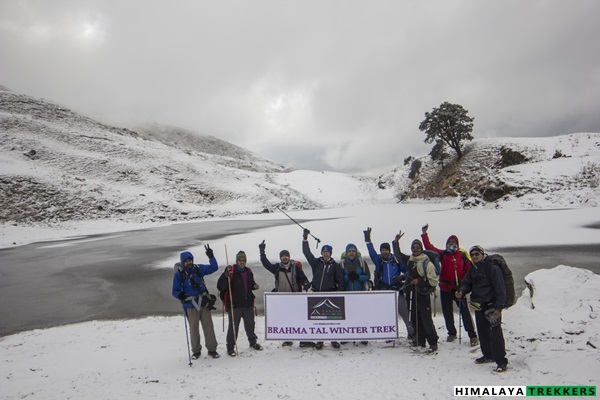 There are certain things in life that everyone wants to cherish until the last day, the experience with HT in December 2014 at Brahma Tal trek was one of its kind. 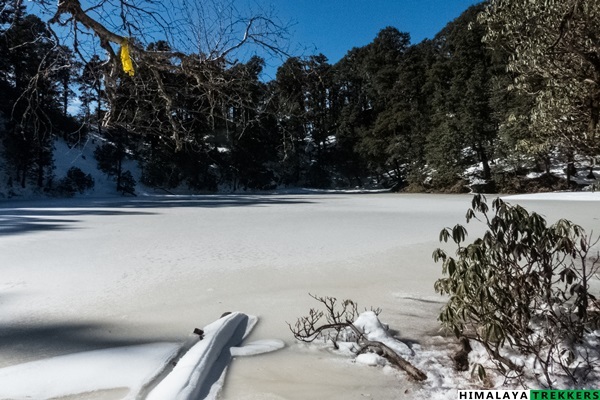 To endure the biting cold of the completely ice caped regions of Garhwal was the biggest challenge. 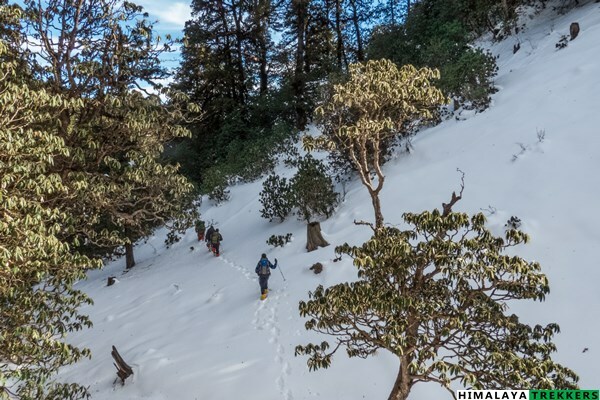 Team HT dared to push the boundaries of a winter trek when many others have nullified the scope of chalking out the trail through the heavy snow. 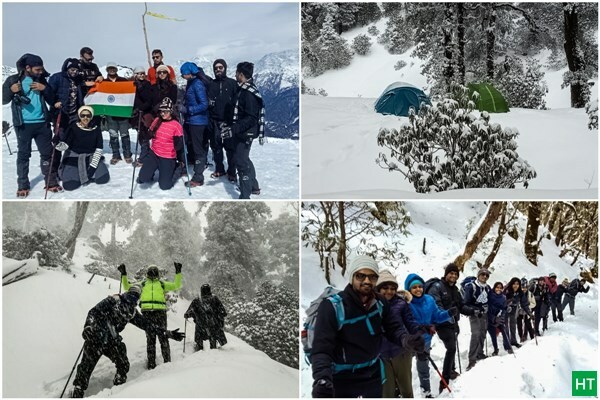 Snow was literally knee deep but the inexhaustible enthusiasm from our Guide Dev Sing and a clued up dexterity from a knowledgeable veteran like Sapta da made the Trek a success. Last but not the least our porters, they were like soldiers in a battlefield, and without them it was unthinkable. 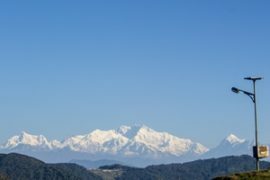 Brahma Tal trek helped me to widen my horizon and relishing photography standing in front of the magnificent Nanda Ghunti , Bhethartoli and mighty Trishul. It is always required to push the boundaries of one’s own abilities, to achieve the unthinkable and cherish the uninhibited. Best of Luck to Team HT and looking forward to join them on another adventure very soon.